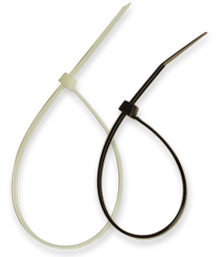 High strength, corrosion resistant, zinc-coated, 7x19 Galvanized Aircraft cable 1/4“, 5/16“ or 3/8“ diameter. 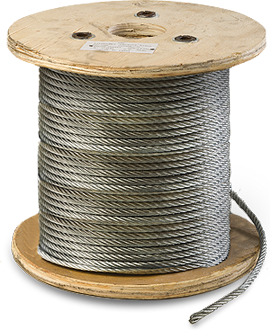 It is a flexible and inexpensive cable used on winches, guy lines and numerous other commercial, industrial and marine applications. Wire rope clip, galvanized, drop forged finish, material steel. Function – To secure the end of the wire rope when turning back to form a loop. 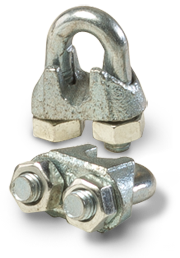 Malleable and drop-forged wire rope clips. Sizes available. 1/4” 3/8”. one-half times their original length and are imprinted with safety instructions. They are ideal for the light to medium duty use. Body, function provides for tensioning and loosening chain and wire rope. An eye and hook, eye and eye design Hot Galvanized – drop forged, many sizes available. black, material of costruction nylon.